One of the largest and strongest preparation and prosecution practices in the Midwest, we provide valuable assistance with developing and administering patent portfolios in the U.S. and worldwide. Calfee's preparation and prosecution practice, among one of the largest and strongest in the Midwest, provides valuable assistance to businesses in many different industries with respect to the development and administration of patent portfolios in the U.S. and worldwide. We handle preparation and prosecution matters for a variety of industries covering all disciplines. Most of the lawyers in our practice have undergraduate and/or graduate degrees in mechanical, aerospace, electrical, computer, biomedical, or chemical engineering; or in chemistry, bio-chemistry or the biological sciences. We can form teams that cover industries where cross-disciplines are needed to fully protect a product portfolio. Our patent preparation and prosecution attorneys are well-rounded patent practitioners that often work in conjunction with our patent litigators to shape and inform our overall approach to patent law. While most of our preparation and prosecution attorneys themselves have experience in patent enforcement, collaboration with our IP Litigation attorneys is invaluable in a client counseling role and for developing strong patent portfolios. It allows us to anticipate potential portfolio development and management problems that other preparation and prosecution lawyers might not foresee, and it allows us to help our clients avoid disputes and optimize their position when litigation becomes necessary or unavoidable. Our ability to collaborate with our IP litigators also enables us, when preparing and prosecuting patent applications, to obtain broad protection and to ensure the validity and enforceability of patent claims through critical insights on claim construction and drafting in the patent preparation and prosecution process. Our attorneys work closely with the inventors to ensure that there is understanding and agreement concerning the invention and the approach to patent protection, including determining the need or desire for patentability searching, practical advice relating to pursuing patent versus trade secret protection, as well as drafting, filing, and prosecuting the patent applications both in the United States and internationally. Calfee represents clients with a wide range of portfolio sizes including sole inventors/proprietors to Fortune 50 multinational corporations. Our patent practice includes a sophisticated team of full-time docket professionals who continually interface with a commercial IP docket / management system. Our docketing team also has experience with large transfers of entire patent portfolios. Through Calfee’s customized extranet solutions, our attorneys and Knowledge Management Team provide clients with timely and secure access to the most relevant information, such as docket status, custom reports, due dates, and electronic document file system. Calfee’s Intellectual Property Group develops legal alerts and other publications on timely topics to ensure that our clients stay apprised of recent changes in the law and other legal issues that may impact their business. Please complete our subscription form, selecting the topic "Intellectual Property / Information Technology," to receive upcoming legal alerts and invitations to CLE seminars. 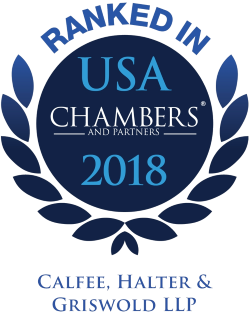 Chambers USA researchers found Calfee's IP team to be held in "very high regard by fellow practitioners who note our extensive experience representing clients in wider patent and trademark matters, IP litigation matters, appellate work, and advising companies on managing IP assets in China."